If you can fill in the blank you’re on your way to understanding visual branding and its important role in brand building for every business no matter its size. Every business needs a distinctive brand voice when it speaks. Do you know what visual cues you’re using to tell others about your brand? 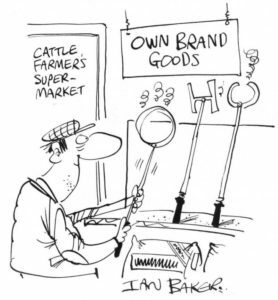 Branding has always been a means of identification beginning with marking the owner’s herd and barrels from community factories. A brand requires careful planning that is implemented over time but it’s launched on day one – the first time you identify yourself publicly as offering a product or service. What are people seeing that provides them with a connection they’ll use to assess and remember you? Impressions about any product or service are influenced by the visual presentation — the message is everything. Any marketing strategy for your business or organization must support a well-defined brand. This support provides the necessary attention, or oxygen so to speak, for the brand to survive and ultimately thrive. There are many aspects of one’s brand to consider such as brand identity, brand image and brand building. At the core of any brand is its graphical presentation which affects perception and recognition. We’ve all seen a business card with the name and contact information printed midst generic graphics which the owner plans to do better after they’re established. Most of us are on a budget so having a fully developed brand at the outset is not possible. However we may not have the opportunity to get past the first-impression stage to show what we can deliver so it’s important to carefully select which brand visuals to implement initially and avoid muddying your brand with mixed messages. If you decide to work with a designer make sure to collaborate with someone who’s asking the important get-to-know-your-business questions. If they’re not, then keep looking. There has to be a strong working relationship to get strong creative results. The humble logo is the perfect place to start developing your brand identity. A brand is more than a mere graphic but that logo is the visual trigger aimed at your target audience. Understanding your target audience or market is very important for business success. It may be true that really anyone could use your product or service but it’s ineffective to overlook identifying the group(s) that will benefit most and market to them specifically. In actuality you’re diluting your brand and not effectively reaching anyone. Information shared with your graphic designer during the creative briefing process, supplemented with their own research, should provide the conceptual connections to leverage design solutions that have solid attributes. If your brand is to be authentic and consistent you need to know who you are and what you need to convey. The marketplace is a saturated and competitive space bombarding clients for their attention. A business only has about 2–3 seconds to capture someone’s interest long enough for them to stop and learn more about the product or service. The logo should be unique to your business or organization thus making it memorable. It’s is a valuable piece of visual real estate whose job cannot be fulfilled by clipart, template-based designs and mass-produced artwork. They all get lost in the visual clutter. Your chances of being noticed increase with unique visuals so the time and money you invest at this stage will pay dividends in the future. A well designed logo contains an embedded idea that communicates visually your brand message in a hidden or overt manner. It must also be able to work in black and white so be mindful when reviewing comprehensives to look at the basis of the design first without being influenced by colour. Once the core design is resolved then colour(s) can be introduced. Also, when developing a logo you should try to anticipate the full gamut of possible end uses for it: signage, packaging, advertisements, billboard, online, etc. This way you’re prepared for scalability in future applications. We’re all acquainted with companies, like Tiffany, that have earned logo recognition that’s evolved to status symbol importance. They didn’t start out that way. However they did make certain that it was an accumulation of all the attributes of a well-designed logo followed by consistent usage and supportive marketing. Regardless of budget we can all use our branding dollars wisely and stand out for all the right reasons. The logo is the flagship image of any brand and can quickly speak volumes about your business, your mission and what services you offer. It is the most essential and valuable visual element of your brand. Your logo is often the first ambassador your client connects with and represents you 24/7. Consistent visual communications affect how you are perceived and received . . . or not!